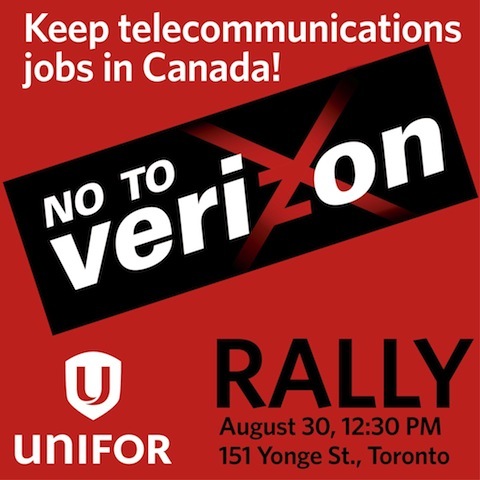 The Communications, Energy and Paperworkers (CEP) and the Canadian Auto Workers (CAW), two of the largest unions in Canada plan to rally this Friday in downtown Toronto against a Verizon “takeover”. Both unions have formed a new union called Unifor, which aims to “advocate for and defend the rights of working people, in more than 20 economic sectors and in communities across Canada,” and will formally unite at a convention on Saturday, making it the largest private sector union in the country. Previously, we have seen other unions publicly protest Ottawa’s wireless plans, such as the Telecommunications Workers Union (TWU), representing workers from Shaw and TELUS across Canada. The CEP also previously addressed national security concerns regarding Verizon just over a week ago. The rally is set to take place at 141 Yonge Street (corner Richmond) on Friday, August 30 at 12:30PM. Who’s going? Who’s not going?